How To Settle For Cheap Car Insurance Without Compromising On Coverage? HomeCar InsuranceNewsSmart Tips for Cheap Car Insurance! 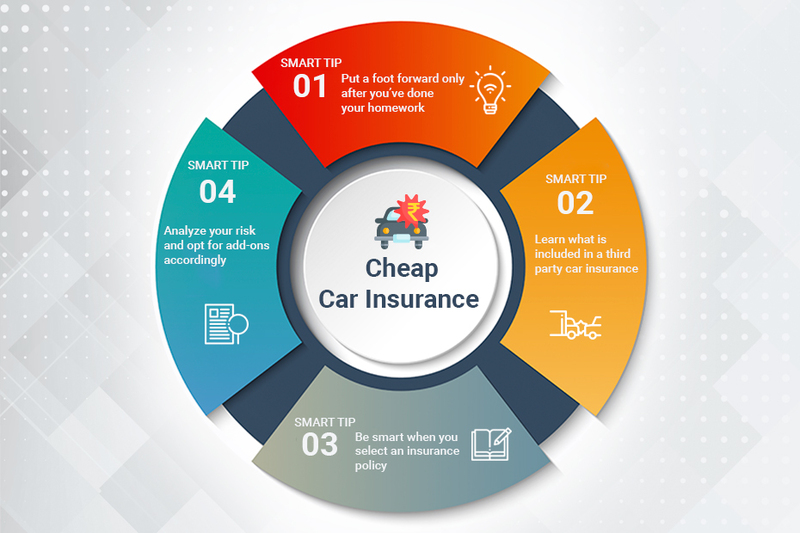 Smart Tips for Cheap Car Insurance! Tricks To Save Smart On Car Insurance Policy. Bought your very first car? Congratulations! Well, before you hit the roads, ensure that your car is protected using a vehicle insurance. Wondering why? To begin with, it is mandatory to have a car policy. Buying new car insurance work wonders in protecting your asset. Whether you are worried about bearing the expenses of accidental damage or footing bills for third party property damage, car insurance is your ultimate saviour. There are plenty of insurance products in the market, all promising you a world of benefits and savings. Getting confused is easier done than thought. So, it is important to buy an insurance plan that’s worthy. However, it is also crucial to choose a cheap car insurance plan. Thinking how you can buy a plan that’s both safe and pocket-friendly? Here’s a couple of tips that will help you pick-out the best four-wheeler insurance without hurting your pockets. Put a foot forward only after you’ve done your homework - When investing in a car, do you make a random purchase? Probably not! You scroll through an array of websites, keep your research game on a roll and finally pick the best deal you get, isn’t it? So, do not rush when you buy car insurance online. Comparing policies is a wise trick. There are a couple of parameters you must look into before choosing an insurance plan. For instance, the claim settlement ratio, price you need to pay, benefits you are guaranteed and so on so forth. So, do your research well before you come to a conclusive decision. Learn what is included in a third party car insurance - The name says it all. Third party car insurance offer coverage against damages caused to a third party property, vehicle or person. It could be any person, who is neither an insurer nor the insured. Consequences of an accident could be ugly. From massive injuries to disability and death. Having a third party policy comes of great advantage in such circumstances. Be smart when you select an insurance policy - Best car insurance is no less important than personal finance. It does take a toll on your budget. Be clear about the coverage you really need. Also, look into the amenities provided. The trick is not settling for an insurance plan that is pocket-friendly. It must tick off your list of requirements. A comprehensive insurance cover offer the best protection. From collision and theft to fire and other damages, a comprehensive insurance plan covers it all. Analyse your risk profile and opt for add-ons accordingly - Why do people buy add-ons? Of-course to optimise protection. Paying for something not required will only maximise your expenses. It is indeed necessary to have a clear mind about the add-ons you require. For instance, if you drive for long hours to distant places pretty frequently, opting for a road-side assistance add-on is well worth it. You certainly won’t be crying for help in a deserted place. While purchasing a vehicle, your dealer might come up with the most attractive insurance plans that’s certainly not a pinch to the pocket. However, settling for the cheapest car insurance prices is never recommended. The thumb-rule instead is to know about the insurance product and compare quotes from multiple insurers. www.insurancedekho.com is a one stop platform. You can learn about the wide range of vehicle insurance plans, compare the quotes and finalise your buy without any hassle.